Upon arriving in the small, industrial space, I noticed the extensive menu, which had my heart going pitter-pat with excitement. I could get currywurst in so many different ways: with bratwurst, bockwurst, rindswurst, and practically any kind of -wurst you could think of. 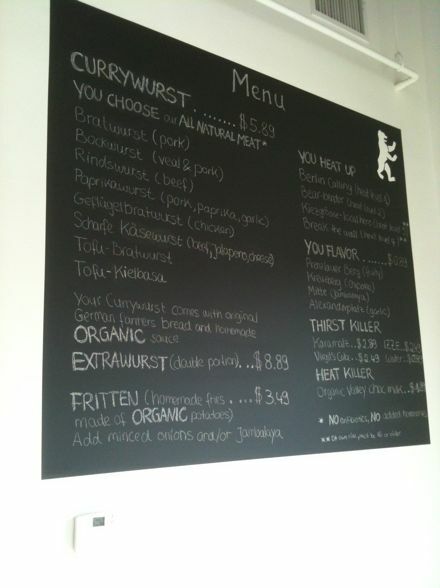 Even vegetarians had options with tofu bratwurst and kielbasa. Aside from the sausages, there were fries (a.k.a. FRITTEN) and other meal customizations including spice level and flavorings, which were all named after places in Berlin (ie. Mitte, Alexanderplatz). Yes, this menu had me very encouraged. Also encouraging: lots of German. The gentleman in front of me spoke German, the woman seated at a table nearby spoke German, and the guy who ultimately took my order spoke German (spoiler alert: turns out he was married to the woman seated nearby). The point is that this wasn’t just some trendy shop set up by hipsters on the East Side. These were real deal Germans. It was all so very exciting, in a Hessian kind of way. Well, I put in an order for currywurst with bratwurst and requested a heat level of three, which carried two asterisks of danger (you have to be sixteen or older to order it). Since I was hungry, I did a double order (for only $3.00 more) and then snagged some fritten and a water too. My total wound up being $14 and change, which was a bit pricey for currywurst, but I let it slide. 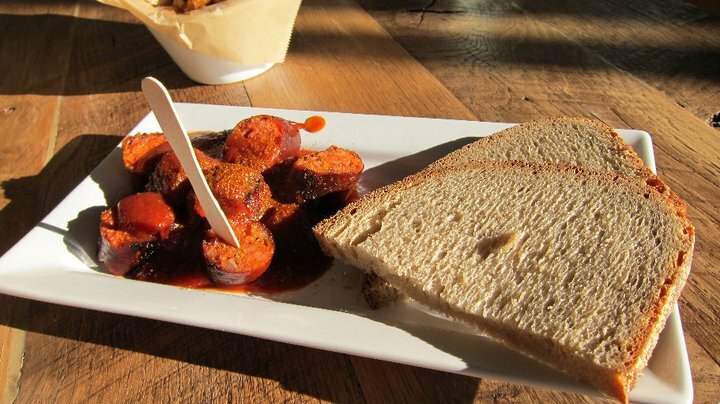 A few minutes later, as clumps of hipsters with dirty hair sauntered into the shop, my currywurst arrived. Happy happy joy joy. 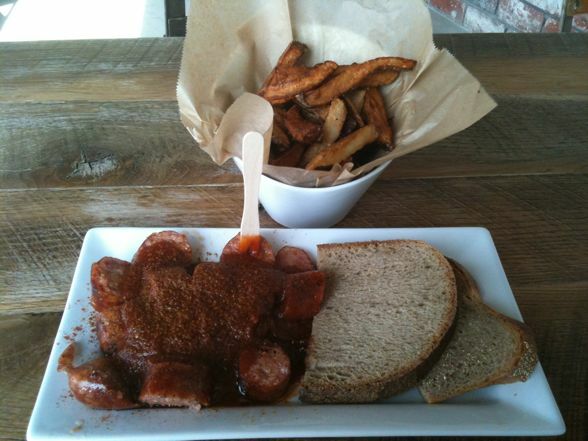 Let met tell you something: this was some damn good currywurst. Not only was the sauce tasty, but the sausage itself was totally delicious. Perfectly taut on the outside, juicy on the inside — it was great. Plus, the spice level was just right. Plenty of heat without burning out of control. The German farmer’s bread served as a lovely accompaniment to the point where the fries were almost unnecessary. I might not get the fries again, and not just because the dish already comes with bread. The fries were cooked perfectly and had a lovely texture; however, they were so salty I couldn’t finish them. Trust me: I do not leave fries over. Sadly though, these were just too intense and made everything else taste super salty. My mouth is still parched as a result. But hey, I can live without the fries. I only care about the sausage, and to that end, I was more than delighted. I will certainly be heading back to this funky little spot to try the other sausages out. Berlin Currywurst, WILLKOMEN! 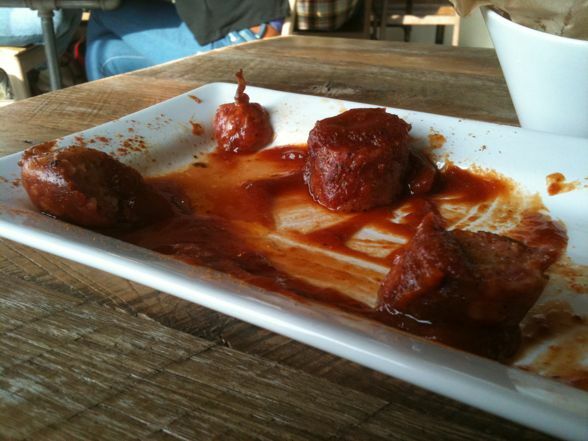 This entry was posted in Food, Restaurants, Reviews and tagged Berlin Currywurst, IndianJones, jash, m_ruv, Phamtastic, restaurants by Ben Mandelker. Bookmark the permalink. OMG! I had curryworst at a German restaurant when I lived in Ankara, Turkey. Send that franchise, if there is one, down to San Diego! My mouth is watering just thinking about it. I’ve not checked for a German restaurant here in quite some time. I guess I’d better do so. I do know a new Thai restaurant opened in Hillcrest recently. I want this in my belly! how funny – i saw this place today when i was going to my overcrowded lunch at forage and had no idea it was brand new! this looks good and intrigues me B, but what I want to know is does curried ketchup taste like curry spice (like the Indian food) or a German variation of it bc one thing I abhor is Indian curry. It makes me gag. beer. talk to me about beer B. please. did you find an outlet for your dimsum craving for the last 2 weeks? Yes! I went to Elite on Saturday and gorged myself on all sorts of delicious stuff. Wonderful website. A lot of useful information here. I am sending it to a few pals ans also sharing in delicious. And of course, thank you for your sweat!